I know this video is going to excite many of you if you already like the basic KWC 1911 and PT92, also known as the Tanfoglio Witness, GSG 92 and many other almost exactly the same guns from Swiss Arms, Gletcher, Cybergun and even Umarex and Crosman. 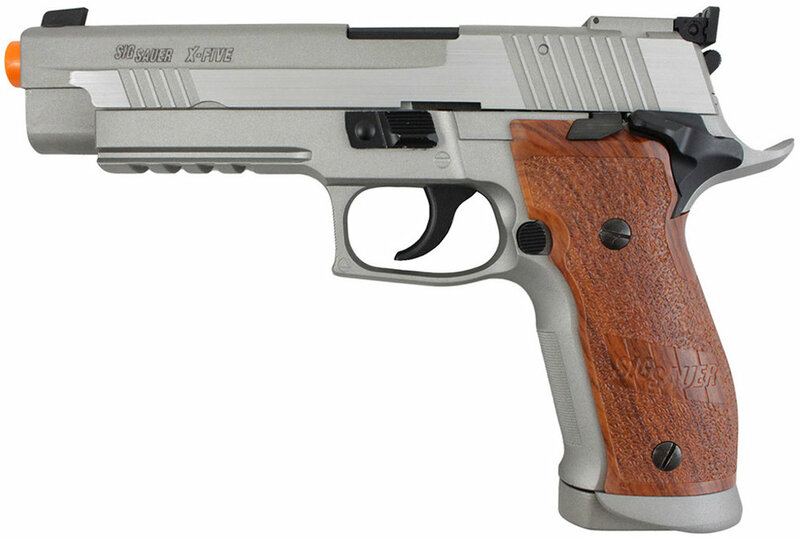 There are tons of these KWC CO2 Blowback BB Pistols and Airsoft Pistols on the market in various versions with all kinds of different licensing on them and I have seen lots of custom modification photos from my viewers showing me how thy have striped and polished their KWC blowback Air Pistols and even added real wood grips. 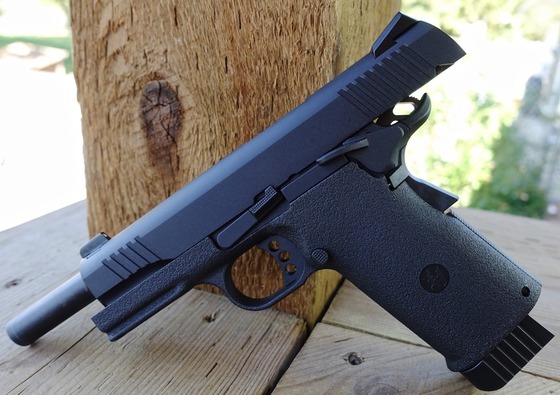 That's why I think it's super cool that now you can get your already blinged out and polished Cybergun/KWC 1911 or PT92 and realy for not a lot more money at the end of the day! The real problems is availability since these stainless versions are in high demand. So what are we looking at in this video? I have two Cybergun/KWC 1911's one is a basic 1911 A1 with a parkerized and stainless frame and slide, you also have a real wood look grip (Looks like wood but is not actually wood...) The basic Swiss Arms 1911 has been called the SA 1911 Seventies Stainless Pistol while the more tactical Swiss Arms SA 1911 is rightfully called the SA 1911 Tactical Rail System since it has a lot more tactical features like a rail, ambidextrous safety, white dot sights, and tactical trigger and hammer. The Swiss Arms SA 92 Stainless which is essentially very similar to the GSG 92 or KWC PT92 again offers a parkerized and stainless frame and slide with the simulated wood grips. Make sure to watch my update video for these three very attractive Swiss Arms CO2 Blowback BB Pistols from Cybergun/KWC and if you're interested in purchasing one you like then see if we have them in stock in our Canada Replica Airguns Store. 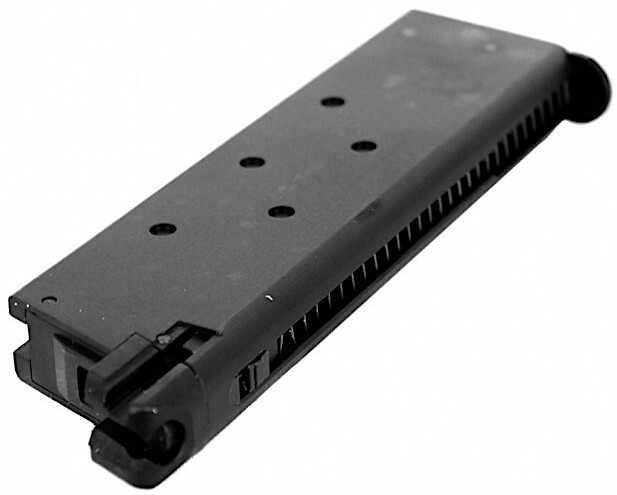 Manufacturer: KWC - Distributed by Cybergun. Weight: 2 pounds (907 grams). FPS: 340+ using .20 gram BB's. 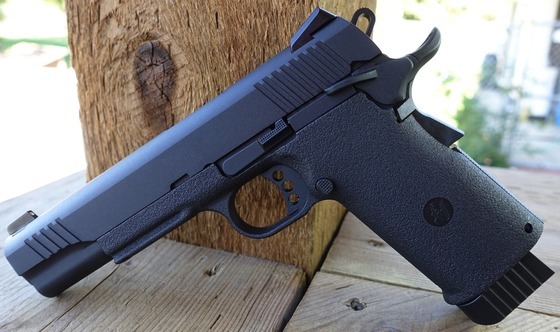 Trigger Pull: The trigger pull on the Cybergun KWC Colt 1911 M45A1 CO2 Blowback Airsoft Pistol is what you would expect from a true single action 1911 styled pistol and typical to all the other KWC 1911's on the market. It has a short take up and then a nice light and crisp release. The working grip safety is a nice touch requiring your palm to be pressed against it for the trigger and hammer to operate.. 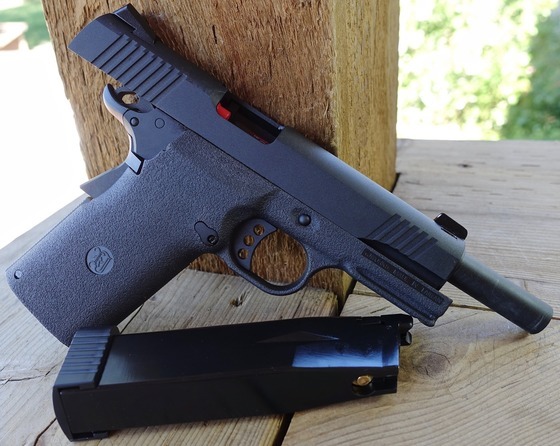 Accuracy: At this point I have not shot the Cybergun KWC Colt 1911 M45A1 CO2 Blowback Airsoft Pistol, I imagine it should perform well considering it has adjustable spin-up or hop-up. According to the manufacturers claimed fps, we should get somewhere in the mid to high 300 fps range using .20 gram Plastic Airsoft BB's. I'll add this one to the list of airguns I need to field test review! 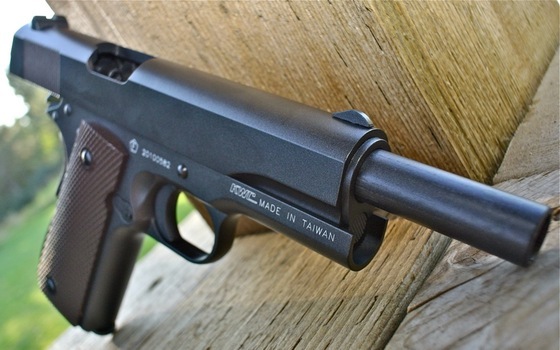 Build Quality: Most KWC built full blowback airguns are built pretty well with an almost all metal build and good overall fit but sometimes the finish can wear off a bit especially in the high points. 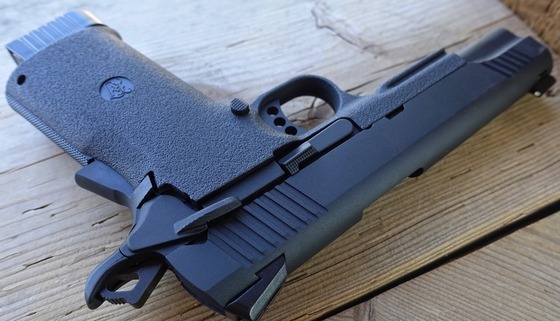 The Cybergun KWC Colt 1911 M45A1 CO2 Blowback Airsoft Pistol seems to have a bit heavier finish on it. I looks really good and seems to be holding up well. 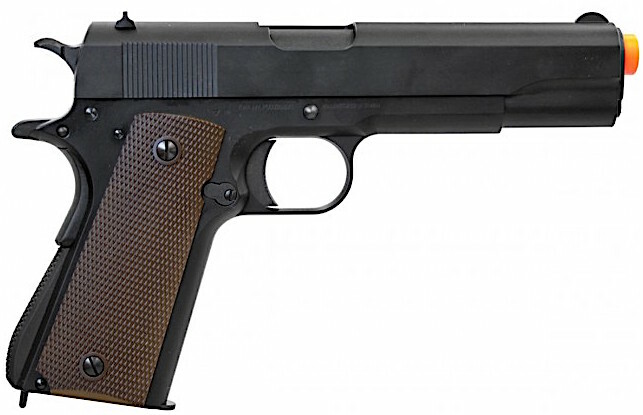 Realism: The Cybergun KWC Colt 1911 M45A1 CO2 Blowback Airsoft Pistol is a close replica of the real steel Colt 1911 M45A1 in almost every way other than the fact that it shoot s6mm airsoft BB's rather than 45 auto bullets :) The only real notable cosmetic difference I saw was the rail having less notches in it. Other than that it is bang on including the layered grips. Very Accurate 1911 M45A1 styled replica. 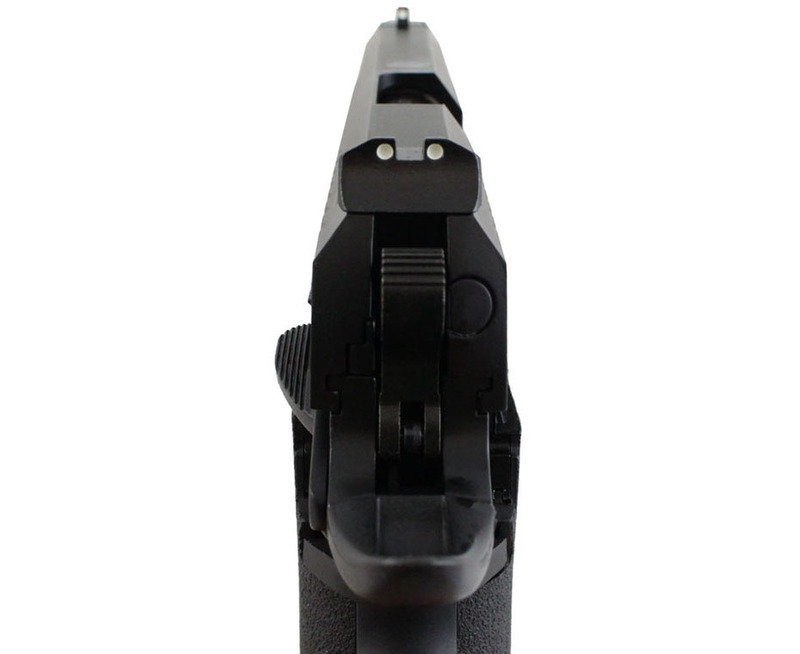 Accurate trigger design and working grip safety. Love the desert tan color and layered grips. Finish on the Cybergun and KWC guns can were off on the high points a bit but some people like the look. Comes with the orange tip (I took mine off). 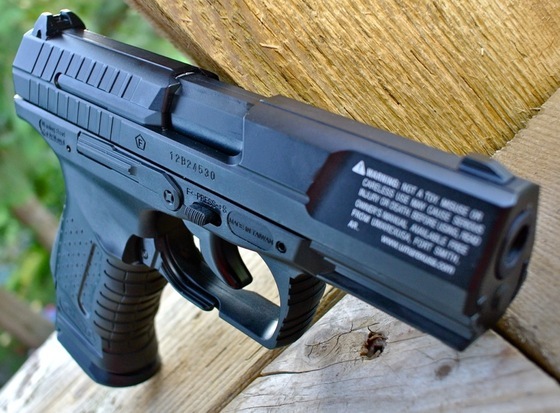 I have always been a big fan of the KWC line of full blowback airguns and this one is no exception. It's kind of interesting that KWC does not seem to make there own blinded out versions of these guns and that a company like Cybergun is distributing them? They do look really great and this entire line with all the variations and new models will for sure keep selling these airguns. And they don't just come in Airsoft versions, I will also be taking a look at some similar 4.5mm Steel BB KWC made airguns shortly! Here is a short video update along with a few photos of my KWC and Umarex Airsoft Pistols recently added to the Canada Replica Airguns Store. The models showcased are the KWC M1911 & KWC M92 (PT99) along with the Umarex Walther P99. All of these pistols use 6mm plastic Airsoft BB's, shoot over 366 fps using CO2 and have blowback operation. 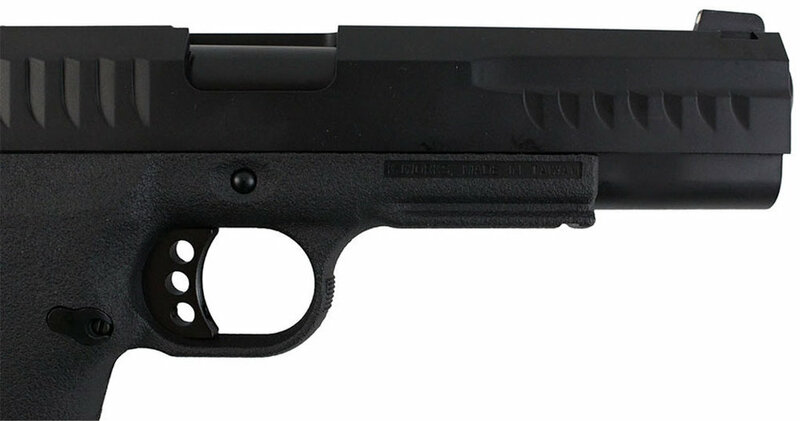 KWC Tanfoglio Witness 1911 Airsoft clone Added to the Canada Replica Airguns Store. 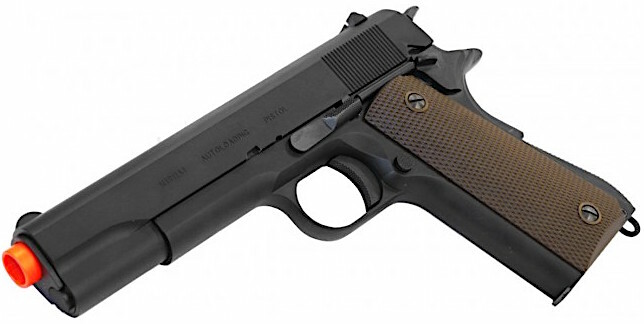 The KWC M1911 is essentially is the Airsoft KWC version of the Cybergun Tanfoglio Witness 1911 without any branding and also in 6mm Airsoft caliber. 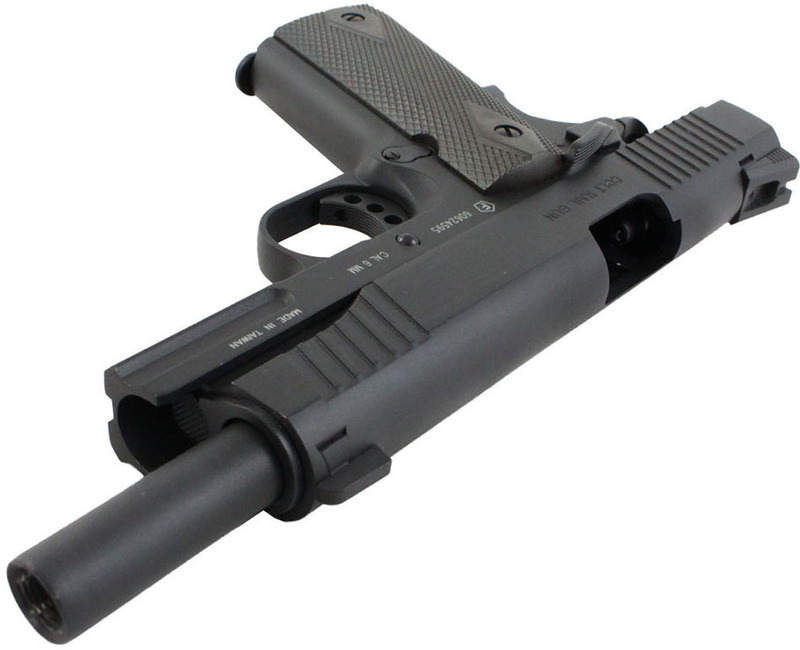 The KWC M1911 features a full size drop out metal magazine that holds both the 6mm Plastic Airsoft BB's and the CO2 cartridge. 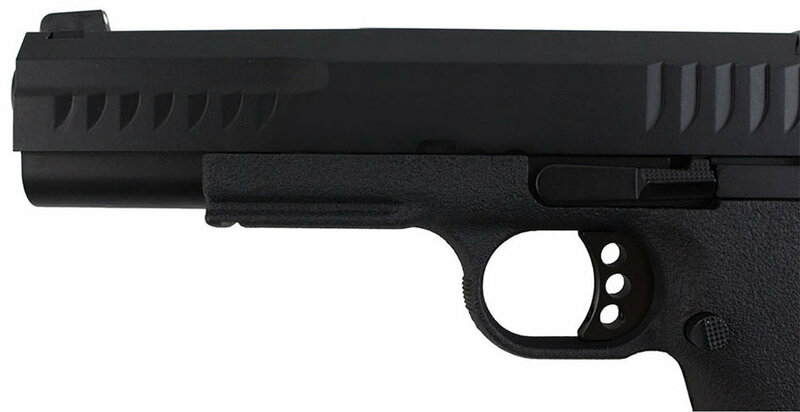 It features a working slide with realistic blowback operation and can be fully field stripped just like the actual 1911 sidearm.